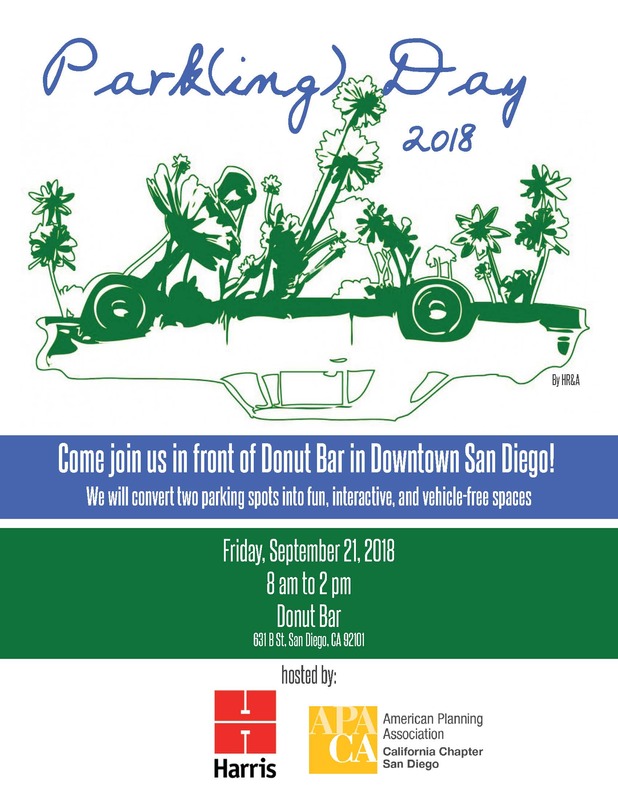 Join us as we convert two parking spaces into a parklet in front of Donut Bar (631 B Street, San Diego, CA 92101). YPG is partnering with Harris & Associates for Park(ing) Day to turn two parking spaces into fun, interactive, and vehicle free spaces. The theme of the parklet is “Shaping our Future” in theme with the APA CA Conference. There will be a photo wall, interactive wall with the San Diego skyline for guests to write how they are shaping San Diego, and an educational table! Volunteers are needed to help set up, tear down and to staff our parklet. If you can’t commit to a volunteer shift, stop by to say hello and take photo at our instagram wall. We hope to see you there!